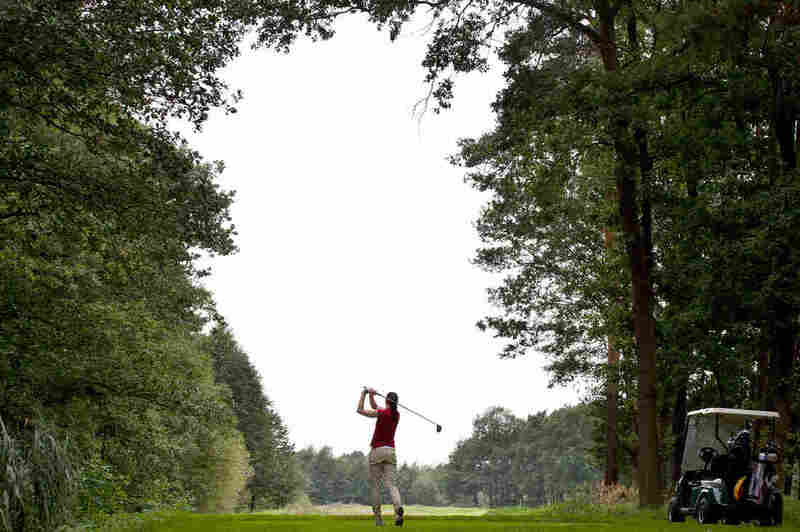 Take A Swing At This: Golf Is Exercise, Cart Or No Cart : Shots - Health News American adults play more golf than any other sport. So how much exercise do you get from an afternoon on the links? Players clipped on pedometers and Fitbits to help us find out. Even golfers using a motorized cart can burn about 1,300 calories and walk 2 miles when playing 18 holes. My first reaction was: Whaaat? Golf is played by people riding around in motorized carts; how much exercise could you possibly get? So, with a fair amount of skepticism, I ventured out to Sligo Creek Golf Course, a municipal course in Silver Spring, Md., to try to answer this question. The first golfer I met came striding off the 9th hole, pushing her clubs with a pushcart. Sweat covered her brow. "No cart?" I asked. Nope, Kelly James told me. "I've gotten well over 10,000 steps playing golf," she said. And that's not all. The game's full of athletic moves. "You're swinging — big swings — to drive the ball," James says. That uses lots of muscles. "There's even a little yoga," she says, if you consider the balancing, and the turning and twisting of the torso — and the overall meditative aspect of being on the course. Ryo Ishikawa, one of Japan's biggest golf stars, demonstrates his swing on the pro tour in February. Hmm, I thought. Maybe I'd underestimated the game. The World Golf Foundation estimates that golfers who walk an 18-hole course clock about 5 miles and burn up to 2,000 calories. But here's the rub: About two-thirds of golf in the U.S. is played in motorized carts. Some resorts and private courses even restrict walking and require carts. Why is the cart culture so dominant? There are lots of reasons, according to Steve Mona, CEO of the World Golf Foundation. For example, carts are a source of revenue for golf clubs. They enable golf facilities "to get more people on the course and get them around the course faster," Mona says. 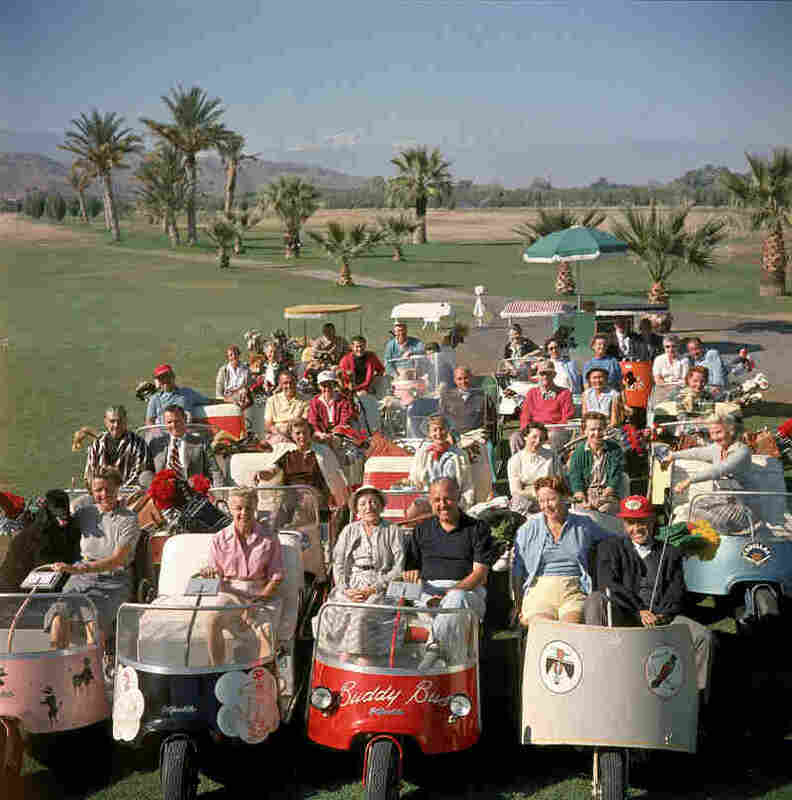 Players pose at the Thunderbird Golf Club, in Palm Springs, Calif., in 1956, when golf carts were first gaining popularity. Another reason: Carts can help older people and others unable to walk long distances keep playing the game. "I started playing when I was 9 years old," golfer Gary Metzger told me. And over his lifetime, he says, he's played a lot of sports. But after two hip replacement surgeries and operations on his knees, "it's one of the few things I can still do." What Metzger loves about the game, he says, is that "it's the one sport you can plan to play the rest of your life." So, cart golfing isn't your scene? The Walking Golfer website can help you find some of the best courses around the country for making great strides on the links. Rob Rigg, of the Walking Golfers Society, says the game originated as a walking game, and "even today, in Great Britain and Ireland, along with Australia, golf is almost always played on foot." He says walking during the game is "a vital part of the journey." The society bases its course rankings on votes submitted by members and the public. There's a lot of variety at the top. "They range from walking-only resorts like Bandon Dunes," Rigg says, "to walking-focused clubs like Ballyneal in eastern Colorado, to CommonGround near Denver, which has a wonderful youth caddie program." The list also includes municipal courses, like San Diego's Torrey Pines, Rigg says, "where walking is encouraged, and push- or pullcarts are always welcome." I clipped a pedometer on Gary's golf partner, his wife, Karen, to see how many steps she'd get during a round of golf using a cart. She surprised me, clocking 2,880 steps — more than a mile — during nine holes. "Wow, that's great," Karen said, when she saw the number. Mona says that the distance she covered is pretty typical. The distance can vary — better golfers, with more accurate shots, may walk less than golfers who have to chase after more shots in the rough — but the foundation's research finds that even golfers using a motorized cart can burn about 1,300 calories during an 18-hole round. "There are lots of places you can't take a cart," Mona explains. You can't take it on the teeing grounds, the greens or in the bunkers. "There's still a lot of walking involved even if you're riding in a cart." There's also a mental boost for lots of players. "There's rarely a bad day on the golf course," Gary Metzger says. "You're breathing good air and looking around at the nice scenery." And this stress-relieving benefit, people in our poll told us, is one of their top motivations for staying in the game.